Alton Veasey Sackett, son of Orange E Sackett and Emma Susan Chesley, was born in Central City, Merrick County, NebraskaG, on 25 February 1887.1,2 He died aged 62 in Cook County, IllinoisG, on 25 October 19493 and was buried at Walnut Hill Cemetery, Council Bluffs, Pottawattamie County, IowaG.4,5 He married in Cedar Falls, Black Hawk County, IowaG, on 1 December 1917, Olive Alice Crinklaw, daughter of George B Crinklaw and Alice A Sims.6 Olive was born in Marion, Linn County, IowaG, on 21 September 1888 and died aged 77 in Waterloo, Black Hawk County, IowaG, on 6 January 1966. "Illinois Death Index 1908–1988", database, Ancestry.com, "Sackett, Alton Veasey, d. Cook County, IL, 25 Oct 1949." "US, Headstone Applications for Military Veterans, 1925–1963", digital image, Ancestry.com, "Sackett, Alton V, enlisted 26 Jul 1918, discharged 30 Dec 1918, serial no. 3812863, Iowa, Corp, company Cas Det #19 [Casual Detachment], regiment 163rd D B [Depot Brigade], b. 25 Feb 1887, d. 25 Oct 1949, bur. Walnut Hill Cemetery, Council Bluffs, Iowa, flat granite marker, ship to Rae J Williams, Supt, 1294 E Pierce St, Council Bluffs, applicant Mrs Alta Schwake, 18 Apr 1950, 1216 Hawthorns, Waterloo, Iowa." "Iowa Marriage Records, 1880–1940", digital image, Ancestry.com, "1 Dec 1917, at Cedar Falls, IA, Alton V Sackett, of Waterloo, IA, RR employee, age 30, 1st m., b. Central City, NE, father Orange E Sackett, mother Emma Chesley; to Olive Alice Crinklaw, of Cedar Falls, IA, age 29, 1st m., b. Marion, IA, father Geo B Crinklaw, mother Alice A Sims. By Rev F Miller. Witnesses: Mrs Alice A Crinklaw, Geo B Crinklaw." Sackett, Robert, son, b. Aug 1891, 8, b. NE, father b. OH, mother b. NH, at school. Sackett, Robert, son, 18, single, b. NE, father b. OH, mother b. NH, clerk, insurance. "U.S., Northern Pacific Railway Company Personnel Files, 1890–1963", digital image, Ancestry.com, Application for employment, "St Paul Station, 8 Sep 1915, Alton Veasey Sackett, brakeman, b. Central City, Neb, 25 Feb 1887, not married, father O E Sackett of 2023 Av A, Co Bluffs, IA, physical injuries suffered: broken collar bone. Ht 5 10½, wt 160, hair dark brown, eyes blue, no marks. Employment approved as brakeman, Jamestown Station, Dakota Division, effective 9 Sep 1915." Resignation, "Jamestown, 30 Oct 1915, Alton Veasey Sackett, brakeman, Jamestown, resigned effective 30 Oct 1915, entered service 9 Sep 1915." "US, World War I draft registrations records 1917–1918", digital image, FamilySearch, Iowa, Waterloo. Draft Division# n/a Roll# 1643363. "Serial# 1748 Order# 3213, Alton V Sackett, 416 Lewis St Waterloo Iowa, Age: 30, b. 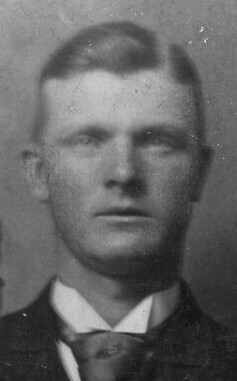 25 Feb 1887 at Central City Nebraska, single, white, native born, brakeman at Gilmore Central RR Co., no reported nearest relative, no prior military experience, exemptions-hernia & broken arch, Registrant: Tall Ht, Med Build, eyes blue, hair light, bald, no disabilities, Reg: 5 Jun 1917 at Waterloo Iowa." Crinklaw, Glen, brother-in-law, 22, b. IA, father b. Canada, mother b. IA, office asst, railroad. Sackett, Alta V, dau, 6, b. IA, father b. NE, mother b. IA. "US World War II draft registration cards 1942", digital image, Ancestry.com, "Serial U4430, Alton V Sackett, 612 1st Ave E, Cedar Rapids, Iowa, mailing c/o Trainmaster, Ill. Central R.R., Waterloo, Iowa, age 55, b. Central City, NE, 25 Feb 1887, contact Mrs R W Young, 3647 Av C, Council Bluffs, IA, employer Illinois Central Railroad, Waterloo, IA, race white, ht 5' 11", wt 160, eyes blue, hair brown, complexion ruddy, no marks. Reg Cedar Rapids, Linn County, IA, 29 May 1942."